From two outstanding creators comes a lyrical and poetic text and beautiful artwork celebrating the lives of children in a remote Himalayan village as they make their work into play. 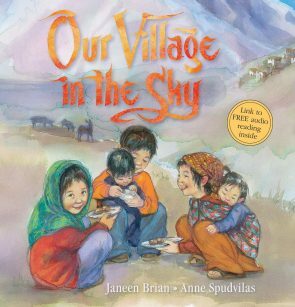 Janeen Brian’s evocative poems, beautifully illustrated by Anne Spudvilas, reveal how the vital work of children in a remote village can be transformed through imagination into joyful play. Anne Spudvilas is one of Australia’s foremost picture book illustrators and is an established artist. She divides her time between commissioned portraits, her work as a courtroom artist, and her award-winning illustrations for children’s books. Her first picture book, The Race by Christobel Mattingley, won the Crichton Award for Illustration and was an Honour Book in the Children’s Book Council of Australia (CBCA) Awards in 1996. Anne has produced many award-winning picture books, including Jenny Angel by Margaret Wild, winner of the CBCA Picture Book of the Year Award, 2000, and Woolvs in the Sitee by Margaret Wild, shortlisted for the CBCA Picture Book of the Year Award, 2007 and joint winner in the Children’s Short Story category of the 2006 Aurealis Awards. Anne also illustrated The Peasant Prince, the picture book based on Li Cunxin’s international best-selling autobiography Mao’s Last Dancer – now a hugely successful motion picture. Anne travelled to China with Li to visit his home town of Qingdao and to meet his family, gathering valuable background material for the book. She has illustrated several chapter books in the Aussie Nibbles and Aussie Bites series and more recently collaborated with Isobelle Carmody to produce the beautiful and haunting The Night School.